Our Notes of INTEREST newsletter is published regularly to provide our customers information about Dairy State Bank and the financial industry. Download a copy of our newsletter to find articles on investing, credit reports, tips on protecting your identity, and so much more. 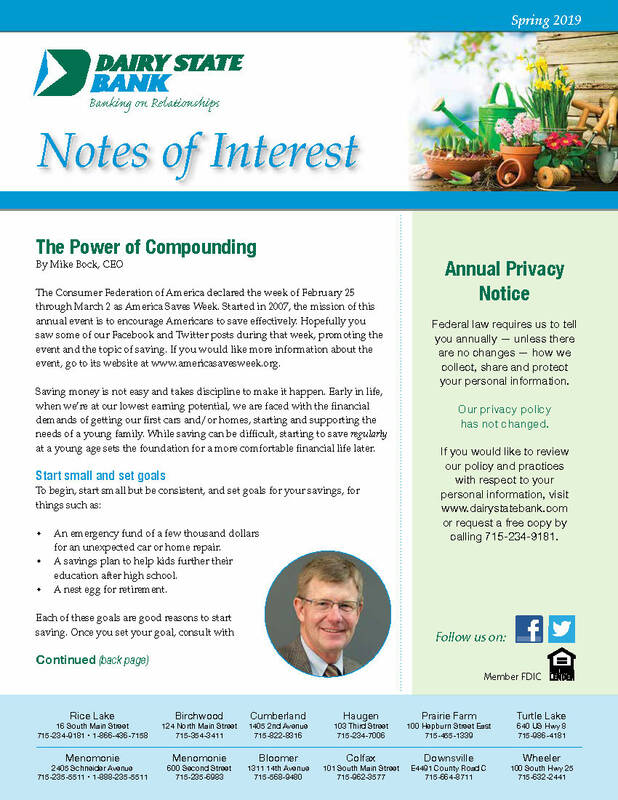 Welcome to the spring issue of our Notes of Interest newsletter. In this issue you’ll learn the advantages of starting to save or invest early in life and the power of compounding, how to get the most from your HSA, and how to handle credit/debit card billing issues. Plus, Online Banking for business is now as fast and easy as Personal Online Banking. All of our newletters are in PDF Format. Download your copy of Adobe Acrobat Reader here.